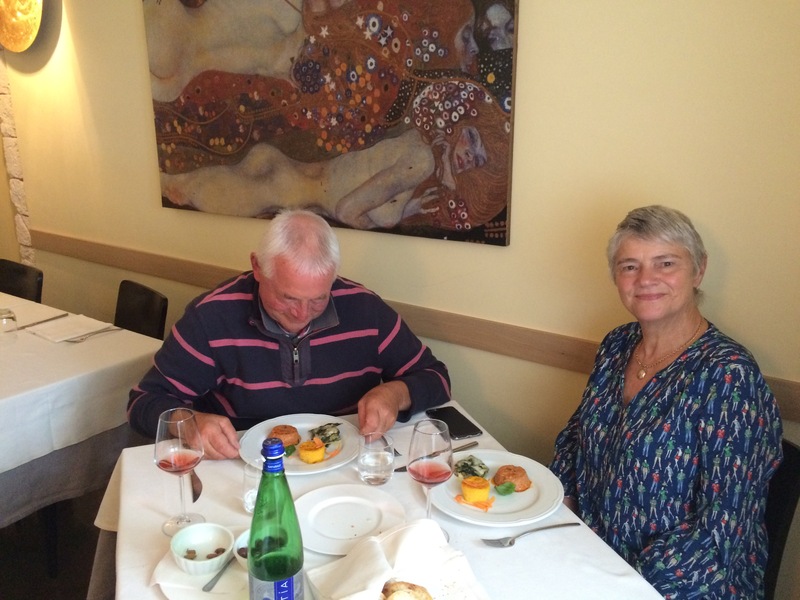 We took a couple of days to travel north to Rimini, then west to Bologna, Verona and on to Lake Garda. Bardolino was a popular lakeside resort and the roads around the town were heaving with traffic. We arrived at “our” camp site only to be told it was full. 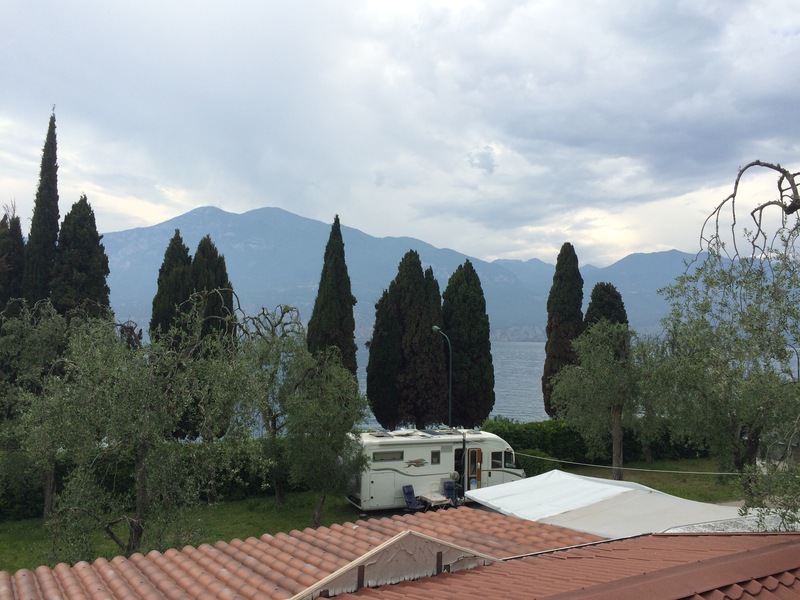 We tried several other campsites along the shores of Garda but they were either full or the pitches were so tightly packed that it would have been torture to spend time there. 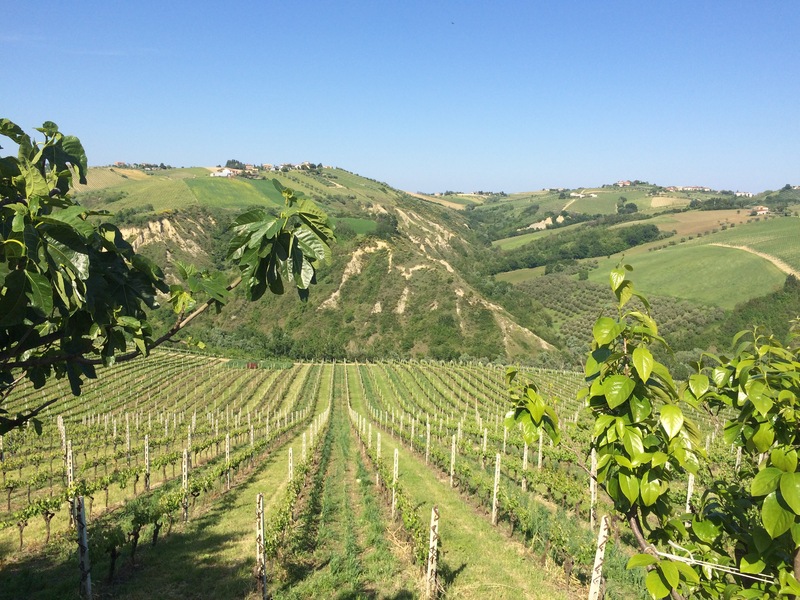 We carried on north until we reached a quieter area near Castellotto, Brenzone and found a little site set in an olive grove by the side of the lake. 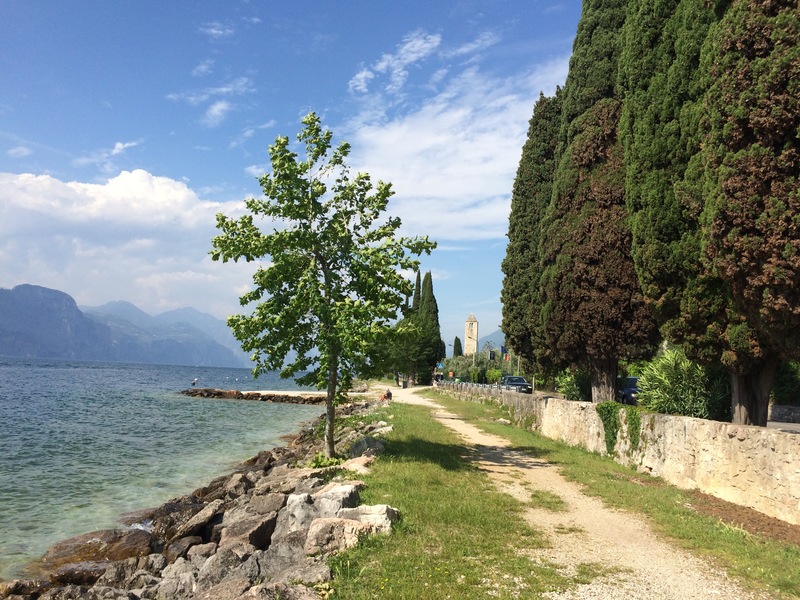 It was perfect for cycling to local towns and walking along the lake. 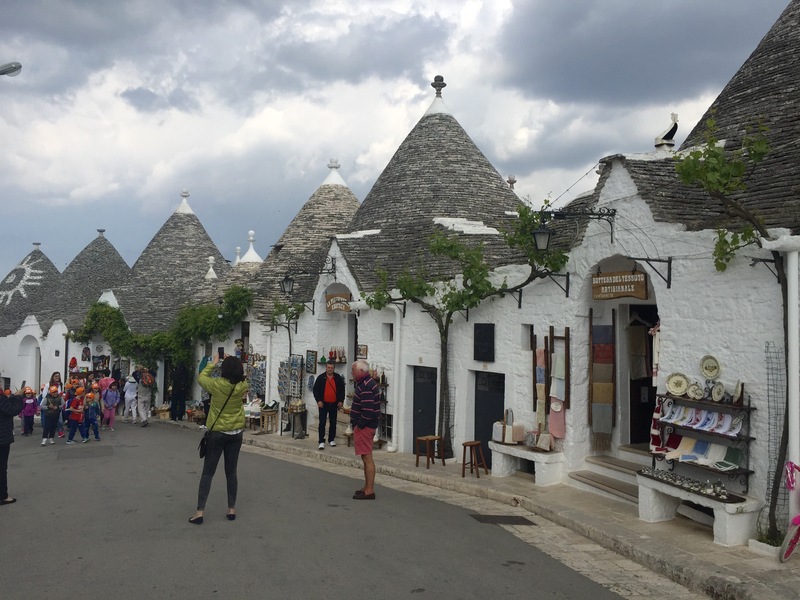 Jacqui and Sergio have a network of friends ever ready to advise them on the best places to buy such important things as wine and olive oil or to recommend a restaurant in a particular area. They are often on the phone to a cousin or a friend who has a cousin or a friend who happens to know . . . 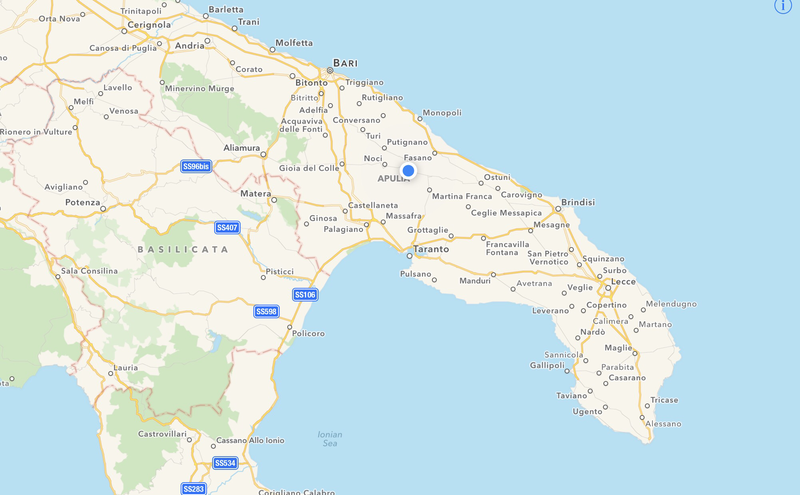 Anyway, according to their friends, Pepe and Adela, THE place to buy wine in the Alba Adriatic area was near the town of Offida up in the green hills, 20k from the coast. We stopped in the old town which was famous for its hand made lace. We had an ice cream whilst we waited until it was a convenient time to call on the wine producer’s mother – it was Saturday afternoon and Sergio explained that the woman who ran the place enjoyed a lunch time glass of wine before she had her afternoon siesta and, in the past, it had proved almost impossible to wake her up until the effect of the wine had worn off. 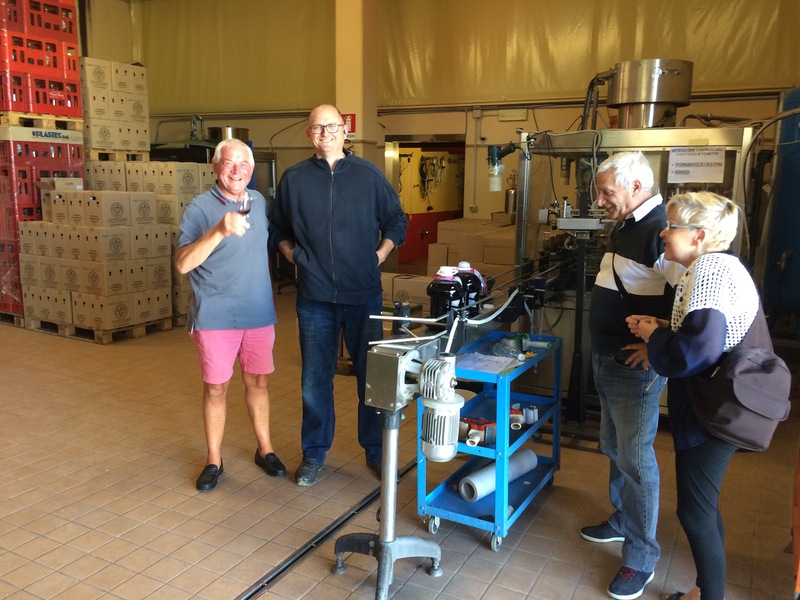 When we eventually got to the winery we found the son was in charge, the mother having gone on holiday. After some careful tasting, we purchased two 20 litre boxes of red wine. The son charged us €1.73 a litre which, apparently, was a real bargain. Sergio said that last time they bought wine with Pepe and Adela the mother had served them and charged them €2 a litre. Sergio resolved not to tell his friend, Pepe, as he would be furious if he heard that we got a better bargain from the son than they ever had from his mother. Our lips are sealed! 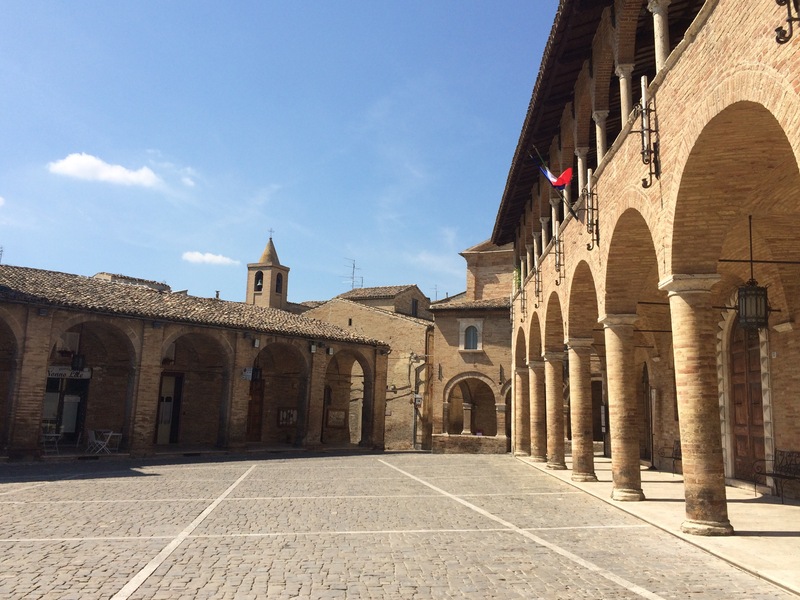 We were staying at one of several modern coastal towns built along a thirty kilometre stretch of the northern Adriatic coast forming major holiday destinations for city dwelling Italians. 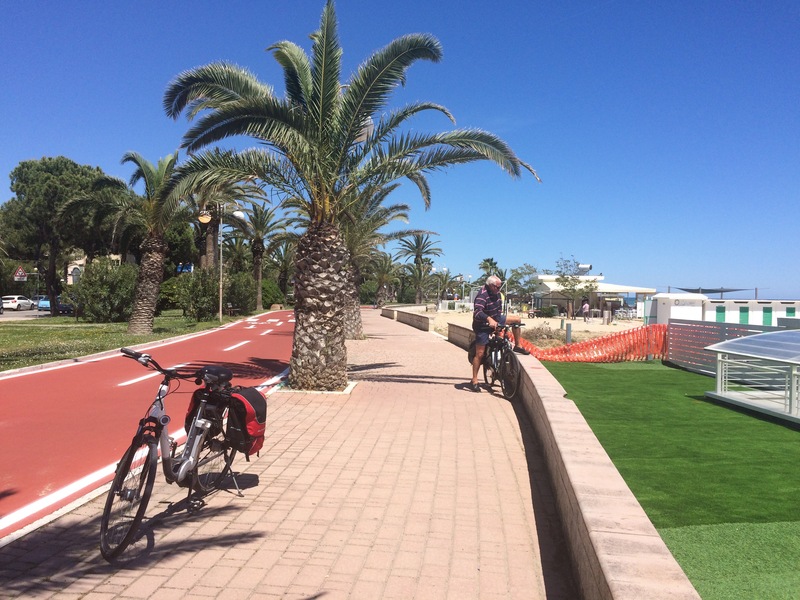 The area had stunning sandy beaches and a long promenade lined with palm trees, with cafés and restaurants and a wide cycle track running alongside the beach. One sunny afternoon we cycled north following the path for 13 kilometres and still hadn’t reached the end of the cycle way. 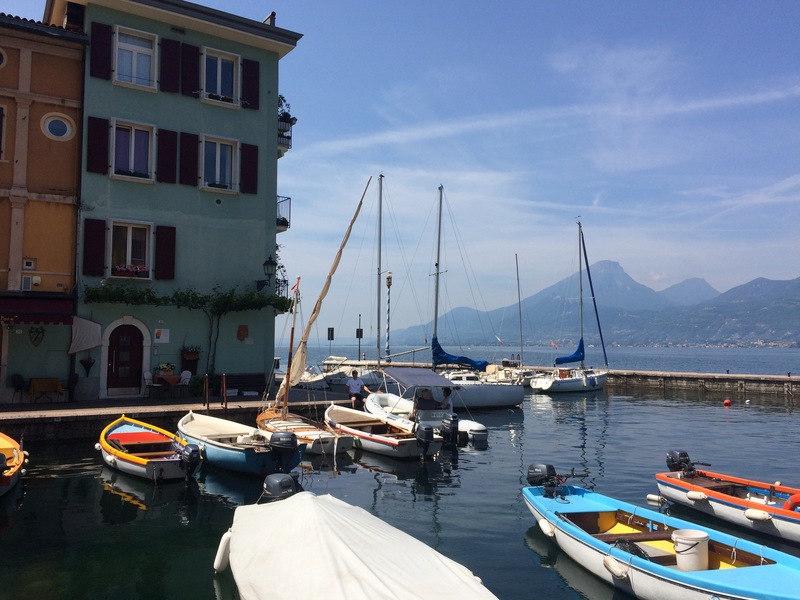 We had to buy an ice cream (fresh Italian ice cream – delicious) before we felt strong enough to cycle back again. 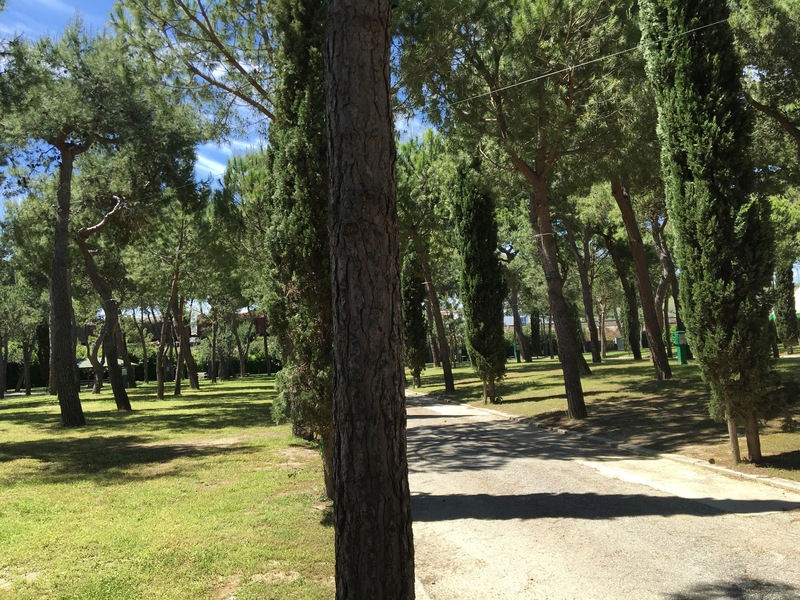 Our camp site was in Salinello, a twenty minute cycle ride from the nearby town of Alba Adriatica. 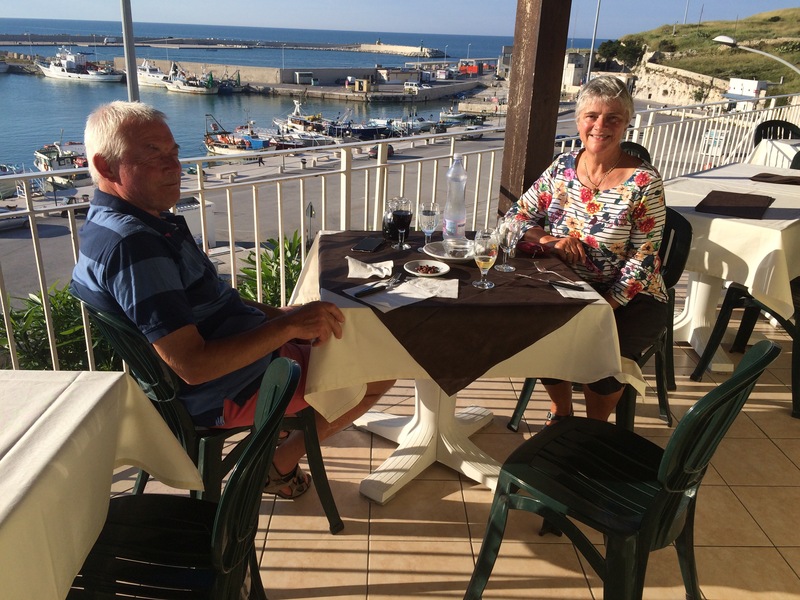 Our friends, Jacqui and Sergio had recently purchased a ground floor holiday flat in Alba Adriatica, which was about two hours’ drive from their home in Tivoli. 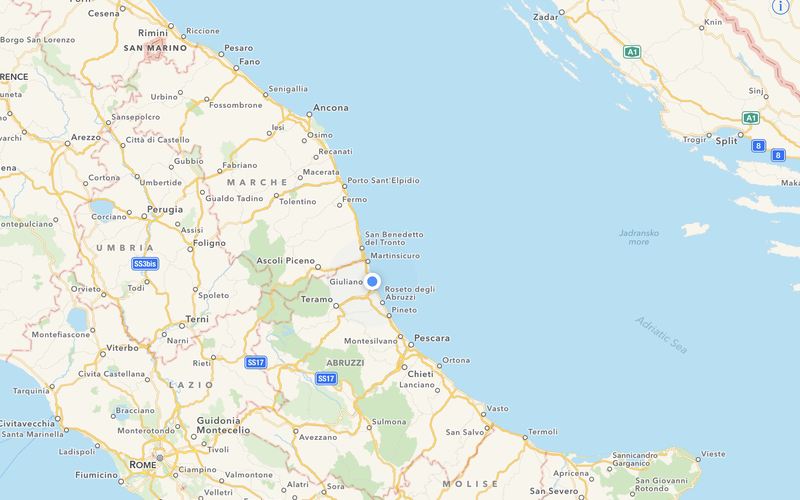 There was a busy railway track that ran along the coast from Venice to Brindisi with a spur running into the Fiat SEVEL plant where vans, pickups and chassis were manufactured and shipped by train to northern Europe. This railway ran right by the seaside resorts and past the campsite perimeter and was noisy day and night. The tourist industry must have considered it a blight on such a beautiful area. We realised that our camper van chassis must have been shipped north on this route. 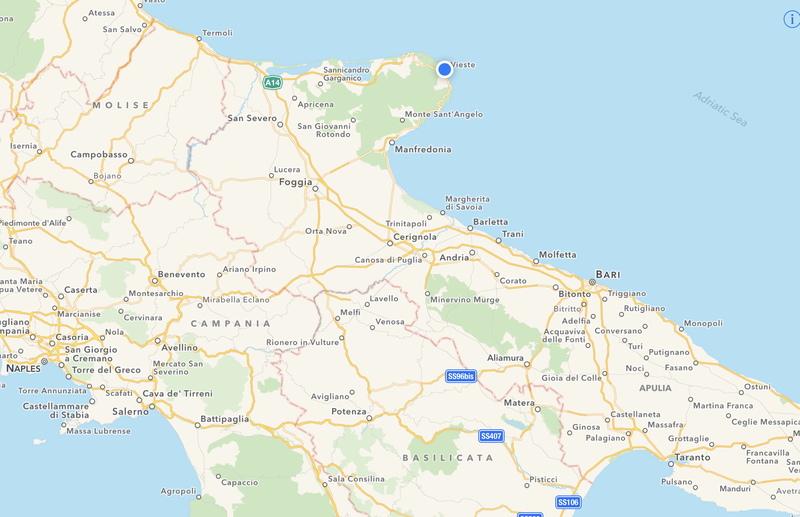 The town of Vieste was situated at the end of Gargano Peninsula, the spur on the Italian boot. 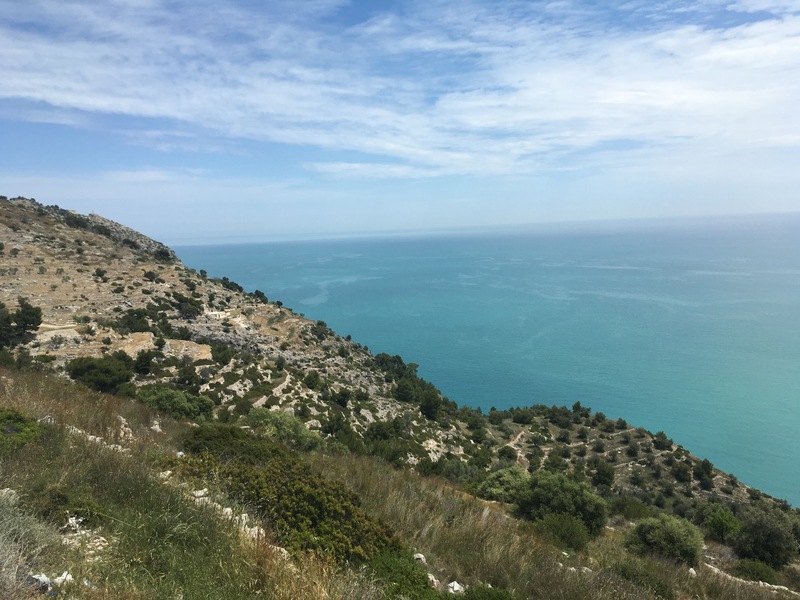 The region was mountainous and was part of the Gargano National Park, the highest point was Monte Calvo at almost 3,500 feet. It took us several hours to slowly negotiate the steep and circuitous road high above the coast, through mountains and ancient oak and beech forests. We breathed a sigh of relief when we finally caught sight of Vieste far below us. 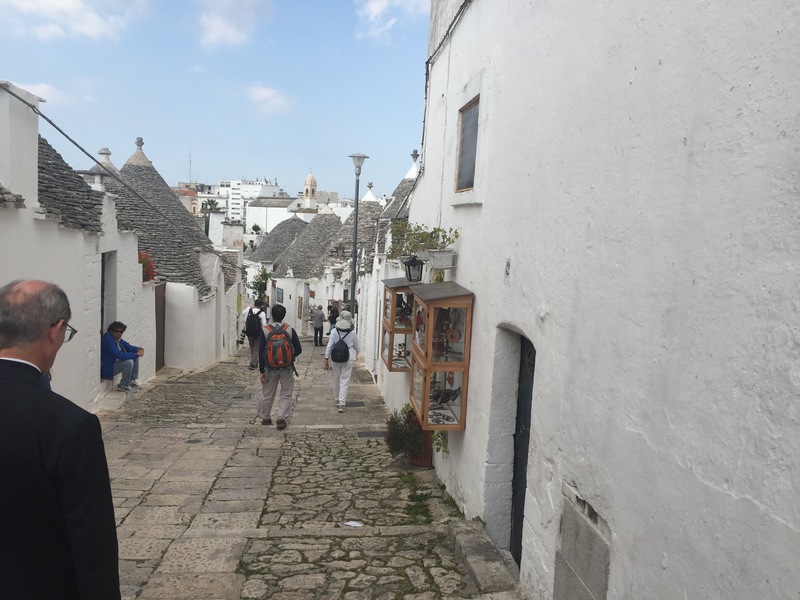 The road plunged down to the coast and ran through the newer part of town past two, long sandy beaches, with restaurants and cafés on the sea side and low rise hotels lined up on the other side. 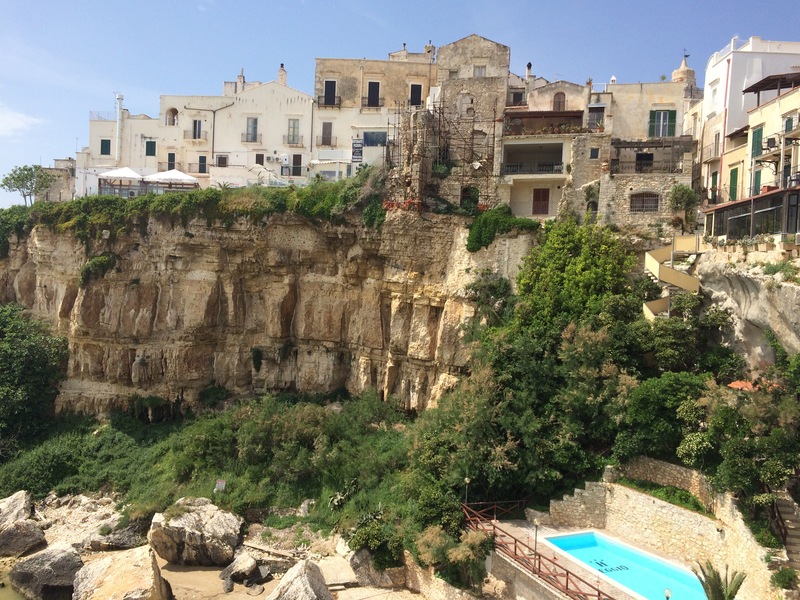 The old town was perched above on a rocky promentory overlooking the beaches and a little harbour. Our site was close to the harbour and whilst we were there the town was celebrating the Feast of Santa Maria. There were parades, loud music and we were treated to amazing firework displays each night. Oh, the joys of having the Internet! The day being Sunday we decided to go out for a lovely Sunday lunch. 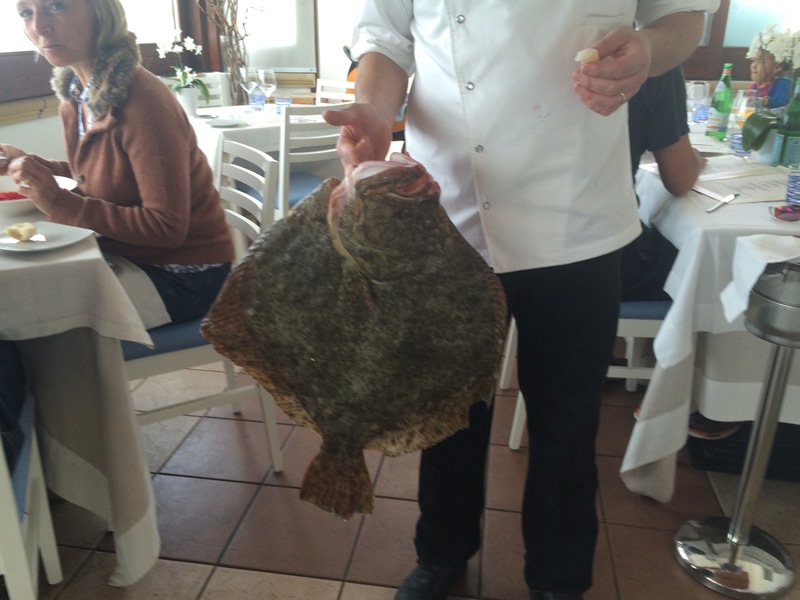 We were able to locate a suitable restaurant ten minutes bike ride away. 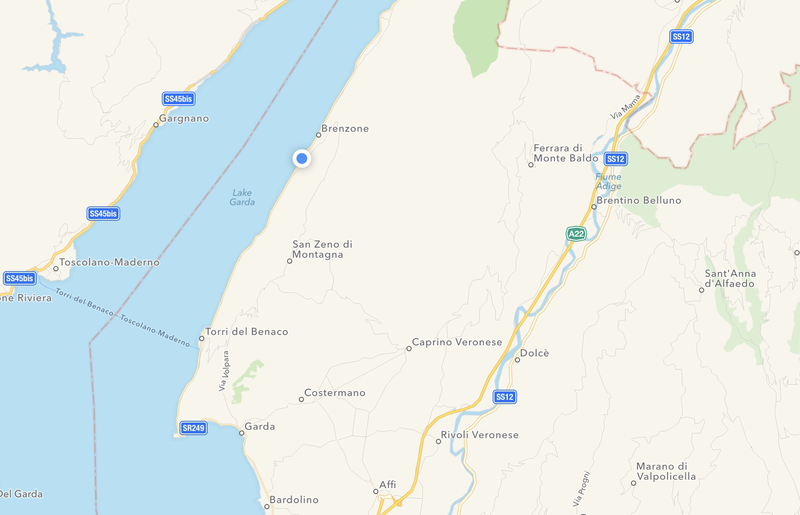 Fidelio was on the outskirts of the town, we would never have found it even if we had hunted for hours. 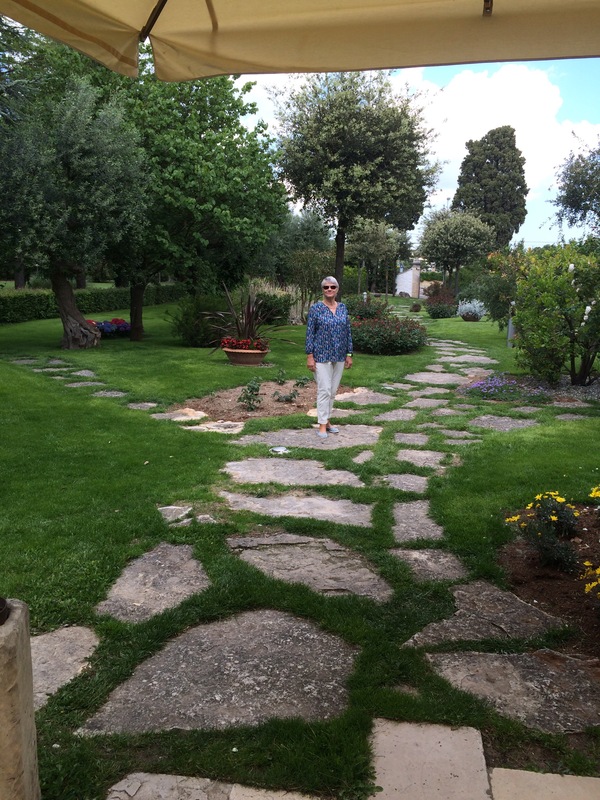 It had a beautiful garden and was already busy serving large family groups when we arrived. We chose the taster menu and spent the next couple of hours devouring three types of appetisers, then two pasta dishes followed by rare steak on rocket salad. The portions were small and beautifully presented. To complete the meal we had dessert and coffee, €25 each plus wine. We needed the steep uphill cycle back to the site! We drove to the Albanian / Greek border at Konispol and spent three quarters of an hour in a queue waiting to pass through Albanian security checks. When it was eventually our turn, our passports were checked and then nothing else happened – we waited for a few minutes and no one seemed interested in us so we just drove off. Two hundred yards on we came to the Greek border and our passports were checked again and we waved through without the van being checked at all. We were asked if we had any cigarettes or alcohol, we said no and we were back in Europe! We only spent one day in Greece (we plan to return). At midnight we boarded the ferry to Italy at Igoumenitsa, cost €340 with a cabin. There were more than a hundred trucks lined up waiting for the ferry and it took almost two hours to load them all. 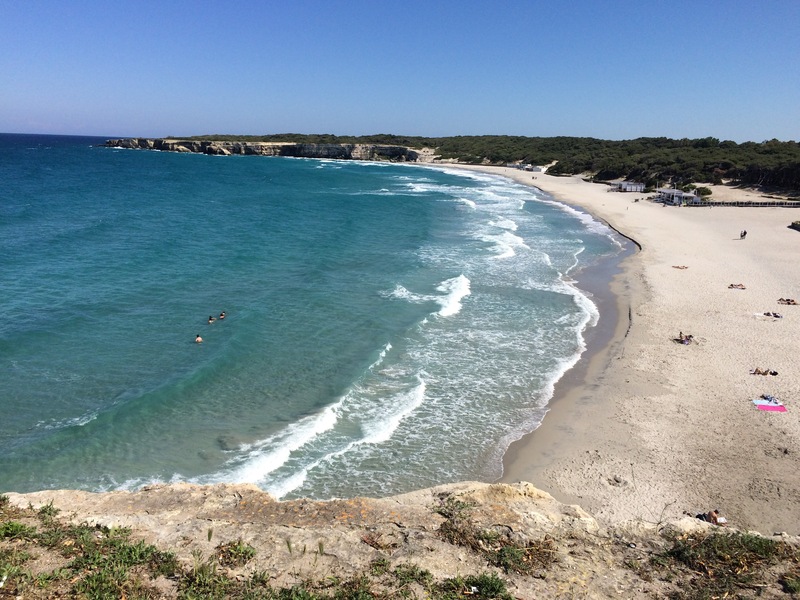 We arrived in Brindisi at 9 am the following morning and drove along the coast to Melendugno. The campsite was 2k outside the town and was a bit of a disappointment. Perhaps we were spoiled with the sites in Albania but, although we found ourselves on the beautiful Adriatic coastline, we were at a tourist resort where the majority of the shops and restaurants were closed until the season got started in June. The main hotel was open and people were sunbathing and swimming on the beautiful beach but otherwise the place was a ghost town. The few shops that were open sold no fresh produce – we wanted fruit, vegetables and maybe a lovely fresh fish – but there was nothing within biking distance but flip flops and sun cream and a few cafés – but it was hard to tell whether they were open for business or not. The campsite was still in winter mode, quick enough to take our money (€25 a night in advance, as against the €16 we normally pay) and the facilities were poor. The grounds were unkempt and the toilet block rustic, although clean enough. There was no washing machine or hot water for clothes washing and wifi was only available at Reception. Such a contrast to the facilities we enjoyed in Croatia and Albania. We moved on as soon as we could.